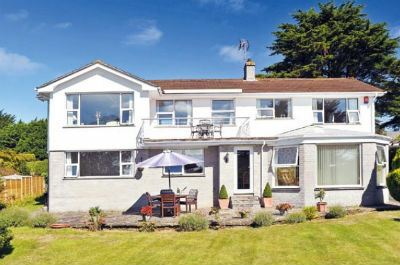 Tree Tops is an appealing family home situated on one of the most highly sought-after roads in south Cornwall. It is a relatively low maintenance property and could easily be bought as a lock-up-and-leave second home. Bar Road is a private, no-through road that offers seclusion, peace and privacy with easy access to both the Budock Vean Golf Club and also the beaches overlooking the Helford Passage. The front door leads through to a reception hallway off which are a sitting room and a kitchen. The sitting room has very good original cornicing and an oil-fired stove, while the front bedroom, sun room and sitting room all enjoy lovely views across the Helford Passage, to the countryside on the Lizard Peninsula beyond. Stairs from the reception hallway lead up to the wonderful first floor sitting room and dining room, while the south-facing balcony is large enough for outside entertaining and dining. Beyond the sitting room is the master bedroom suite which has far-reaching views overlooking the Helford Passage. The views from both the master bedroom suite and the first floor sitting room are quite breathtaking. Outside, an immaculate lawn lies to the front of the house and a further lawn to the rear leads straight onto the golf course – the terrace is another useful place for outdoor entertaining. Tree tops is located by the Area of Outstanding Natural Beauty at the Helford Passage in South Cornwall, just over four miles from Falmouth.